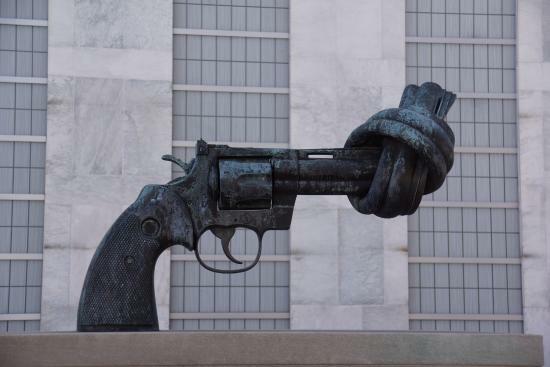 Reflections and Ruminations: Selflessness and sacrifice is the only way gun laws in America has any chance of change. And that’s why things will most likely stay the same. Selflessness and sacrifice is the only way gun laws in America has any chance of change. And that’s why things will most likely stay the same. Last week in Las Vegas, the world was once more horrified by another mass shooting in America, where 58 people were murdered and more than 500 left wounded, making it the deadliest mass shooting in modern US history. As expected, it opened once again the debate of gun laws, with those who are pro-guns defending their right to own guns, and citing the fact that it is not guns that kill people but people who own guns. America does seem to be in a quandary that simply will not be settled because as much as there exists a sizeable number of Americans who are opposed to gun ownership, there will be large numbers of Americans citing the coveted Second Amendment, which establishes the right to keep and bear arms. I am not an American. I am a Singaporean who lives halfway across the globe from America, and I am sure that like me, there are many who are non-Americans and who come from countries where there are very strict gun laws and who are unable to fathom how it is that even though mindless shootings occur with such alarming regularity, causing such mayhem and carnage, that the pro-gun populace just cannot seem to soften their stand on their right to bear arms. While I do understand that a gun left in the drawer, a safe or in a locked cabinet will certainly not cause anyone death or injury, it is undeniable that it is the fact that there are firearms within reach in the first place that makes any shooting possible. As I reflected on the entire issue, it became clear to me that it is not just an arms issue. At the heart of it, it is really an issue of rights. As long as Americans are brandishing the ‘rights’ placard in the face of their fellow Americans, there will be no change in the gun situation. Modern America has always prided itself as the nation of the free, where citizens are protected by their rights. It does seem then that the only way this issue needs to be broached is to have individuals to be willing to give up their own rights, for the sake of the greater good. This doesn’t change the constitution, but it changes the way citizens live with the constitution. The skeptic in me (or the realist, depending on how one looks at it) knows that this is never going to happen, at least not in the next few generations. When Jesus says that he is the way, the truth and the life, he is also saying that in him is the key to the peace that he brings. What Jesus embraced is not rights nor any semblance of entitlement either. Paul’s letter to the Philippians pithily states that he ‘assumed the condition of a slave, and became as men are”, and that “he was humbler yet, even to accepting death, death on a cross”. Herein is probably the only way this issue of gun ownership is going to be resolved. It is in not clinging on to one’s rights, even though one has those rights. In fact, it is in relinquishing one’s rights that this will find some resolution. That Jesus “emptied himself”, and saving the world by this kenosis is key to understanding that we need to look at Jesus as our model and reason for a similar emptying of self, or rights, and to deny ourselves. We won’t save the world when we do this, but we will definitely work towards the greater good, even if it is one gun at a time. Selfishness is the seedbed of all that is sinful and evil, and the only antidote to selfishness has to be its antithesis, which is selflessness. Our sinful and broken human nature will always cling tenaciously to what we want, how we want, when we want. This is the unspoken narrative underlying the culture of rights and entitlements. Rules or punitive measures meted out on those who insist on their rights will not see a peaceful willingness to want the greater good for all peoples, which is a safe environment free of guns. The only way for this to work is if there is a nation-wide freely accepted willingness to choose to not want to bear and own arms even if one has the right to. And because this is so unfathomable, it is not a matter of whether a massacre similar to the Las Vegas one will take place. It is only a matter of when. The world doesn’t seem to be shocked by such stories of carnage any more. And if you ask me, this in itself is shocking.